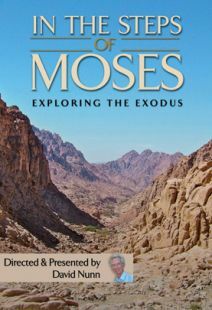 In the Steps of Moses -- An exhilarating exploration of the life of Moses and the book of Exodus. Host David Nunn carefully traces the Biblical texts and takes us to the very places where the events happened. The Exodus stands as the iconic event of the Hebrew Scriptures, and In the Steps of Moses shows us what really happened and why this ancient story continues to change the world today. 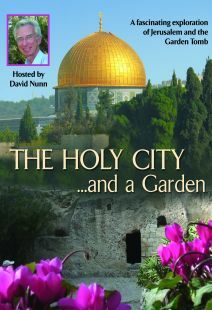 The Holy City and a Garden -- An upbeat, informative journey through Jerusalem with host David Nunn. Visit some of the Holy City’s most intriguing attractions – the Western (Wailing) Wall, the Dome of the Rock, the Garden Tomb— and discover the history behind their triumphant yet turbulent past. It’s the next best thing to being there in person to experience these fascinating locations in all their magnificence! A free Biblical reference guide in PDF is included. 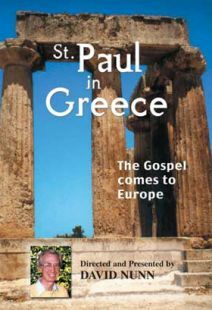 Paul in Greece -- Host David Nunn takes us to the original locations where the dramatic events of the Book of Acts took place and unfolds the impact of Paul's message of the risen Savior upon those communities. This captivating program explores the route of Paul’s second missionary journey and his adventures along the way. The places visited include Neapolis, Phillipi, Thessalonica, Berea, Meteroa, Corith, Ephesus, and Jerusalem. This is a fascinating way of visualizing the historical context of the Bible, making it a valuable learning resource for group or individual study. 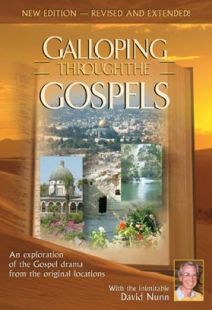 Galloping through the Gospels (Extended Version) -- A fast-moving exploration of all the major sites featured in the Gospels. Starting with the Annunciation, David Nunn follows through the Gospel drama chronologically, providing fascinating and illuminating insights into the life of Jesus. From Bethlehem, David takes us to Nazareth and its surrounding terrain, which witnessed so much of the Old Testament history of Israel. Then it is on to the wilderness, where John called people to repent, then to the River Jordan. In the lush beauty of Galilee, we visit many of the sites most associated with Jesus: the Mount of Beatitudes, Tabgha, Capernaum, the lakeside and more. We discover why Jesus chose Caesarea Philippi to elicit Peter's momentous profession. We explore the headwaters of the Jordan around Dan before following the path of Jesus south to Jerusalem, passing through Jericho. In the Holy City we trace the passion of Jesus from betrayal, trial and crucifixion to the resurrection and ascension. 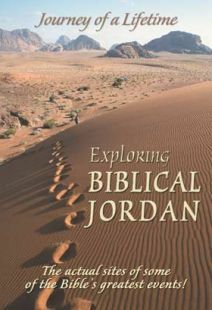 Exploring Biblical Jordan -- More and more discoveries are being made in the land of Jordan related to the actual places where some of the greatest Bible events took place! 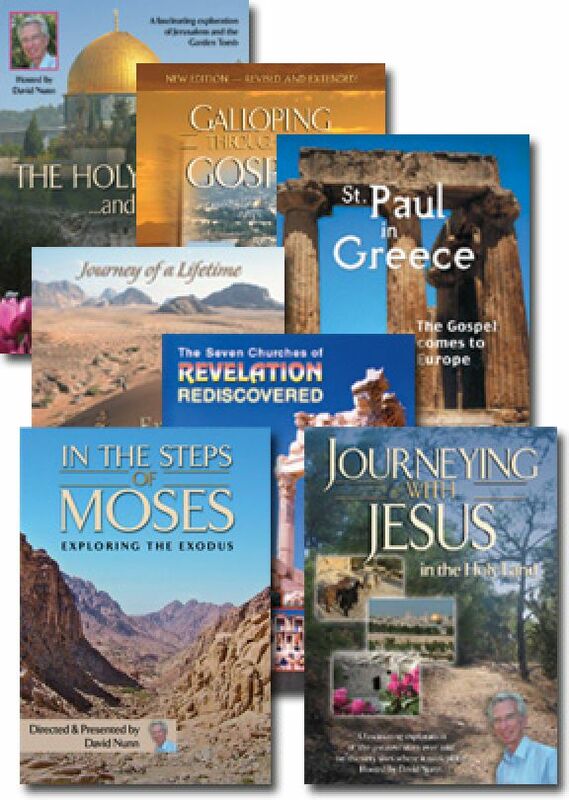 Journey with David Nunn in this compelling video in which Bible events come to life. Follow the adventures of Lot, as he fled from Sodom and was sheltered in a cave; Jacob, as he wrestled with God by the river Jabbock; and Moses, as he led the great Exodus northwards from Aqaba. There's Mount Hor, where Aaron died and was buried; the plains of Moab, where Moses gave his final instructions and blessing; Beth Peor, where he pleaded to be allowed to enter the Promised Land; Mount Nebo, where he glimpsed it and died; Amman, where Uriah was killed in battle. We visit Elijah’s homeland and the site of his dramatic departure; Petra, where the wise men possibly brought their gifts. At Bethany beyond the Jordan, John baptized Jesus, and Jesus met his first disciples; at Machaerus, John was imprisoned and beheaded. We even descend to the tombs, which the Gadarene demoniac frequented. These, and much more, make this a unique and gripping program. A Biblical exploration that really comes alive. 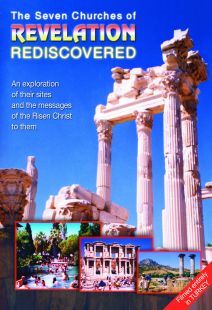 The Seven Churches of Revelation Rediscovered -- Host David Nunn takes us to Turkey for a firsthand visit of the seven cities to which the messages of the risen Christ were addressed in Revelation chapters 2-3. Their significance is explained in detail, and viewers will gain many insights from David's enthusiastic commentary along the way. Not only do we see the natural beauty of Asia Minor, but the most important points in each letter are brought vividly to life. A valuable resource for personal or group study. 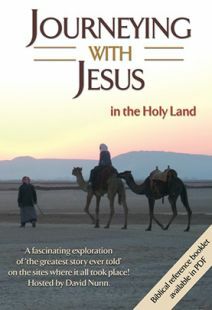 Journeying with Jesus -- Once you've seen this film, reading the gospels will never be the same again! Events in the life of Jesus leap dramatically from the page when one can visualize their original setting. This brand-new production sweeps us inexorably through the "greatest story ever told," from Jesus' birth in Bethlehem to His triumphant ascension on the Mount of Olives. David Nunn's enthusiastic presentation never tires as he features the latest archaeological discoveries and the insights they provide. This film is an inspiration and education for all ages. It really enables one to "walk with Jesus" in the company of His disciples. Inlcudes Biblical references in PDF. Widescreen.